Small Animal Talk: What is One Welfare? Alternatively, according to the Centres for Disease Control, “The One Health concept recognises that the health of humans is connected to the health of animals and the environment”. So what is One Welfare? This newer phrase on the block is less well defined, but essentially it requires us to consider the welfare of humans and non-human animals simultaneously. For many readers this link will seem obvious, but when you think about the way human wellbeing and animal welfare are managed in real life, they're not always treated as being linked. One Welfare recognises that the welfare of animals and the wellbeing of humans and societies are not mutually exclusive, and quite often when you look deeper they’re inextricably intertwined. One Welfare is an umbrella under which experts in animal welfare can collaborate with experts in “human” services – social work, psychology, public health and so forth – to develop solutions that hopefully benefit the welfare and wellbeing of all species. At this point I should declare I will be speaking about the development OneWelfare teaching portal, which received an Office of Learning and Teaching Grant and was led by Professor Paul McGreevy. But aside from teaching, the conference will be addressing what One Welfare looks like in practice. 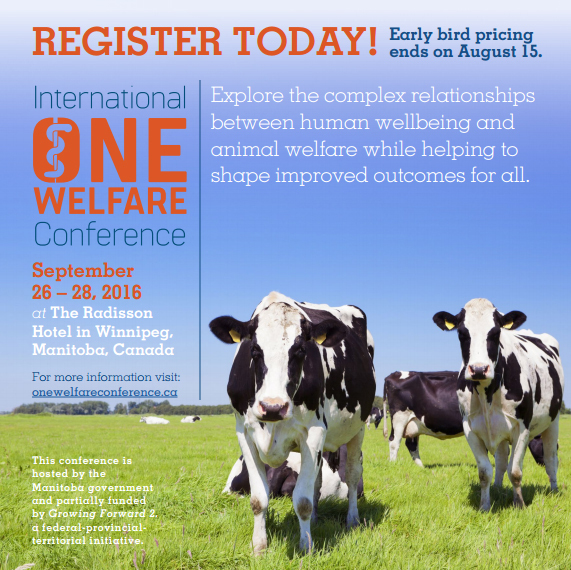 If you work in the fields of human or animal welfare, attending this conference will give you a chance to be part of setting the agenda for One Welfare. I may be biased here, but I believe it is very important for as many of those working with non-human animals as possible to have a seat at this table. The conference dinner on September 26th will be held at the new Canadian Museum of Human Rights. The speaker is Lt. Gen. Romeo Dallairre, appointed Force Commander for the United Nations Assistance Mission for Rwanda (UNAMIR). He witnessed the country descend into chaos and genocide, leading to the deaths of more than 800,000 Rwandans. Ever since he has personally battled with post-traumatic stress disorder and become an international leader on PTSD in the Workplace. In addition, delegates can participate in a Psychological First Aid Course taught by the Canadian Red Cross. This will focus both on training for first responders as well as for those responsible for the care of employees in the workplace so that staff are not put at undue risk for mental health trauma. This course is being designed specifically for the participants of this event. For more information, visit this site. Earlybird rates are available until August 15.